We like to ride motorcycles and we like to ride them far. In this great land of the open road and plenty of refueling stations, the main thing holding us back is, well, us. If you are a rider looking for a helmet geared towards keeping you on the road longer, through more conditions, comfortably, then just keep reading! 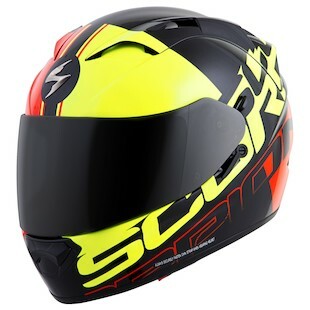 The Scorpion EXO-T1200 Quattro Helmet is an option for the touring crowd that wants to spice things up a bit over a standard solid colored option. As it is built on the frame of the EXO-T1200, it will come with a slew of great features such as the Ellip-Tec closure system which creates a fantastic seal between the helmet gasket and the faceshield to keep wind buffeting down and the inclimate weather out. You will also be able to make use of an internal sun visor that can be dropped down in bright conditions and retracted when there is less light. This essentially gives you two faceshields for the price of one. Internally, you will enjoy the plush KwickWickIII moisture-wicking interior and the ability to comfortably wear eyeglasses without feeling too squished. All of these features are meant to help you get the most out of your time on two-wheels and with the graphical option of the Quatro, Scorpion increases your style choices as well. As this gear update is fresh off of the press, there are no images available at this time, but, as always, our goal is to keep the interwebs as informed as possible about what's new and what's next. Stay tuned for photo updates to come. Comfort and longevity are both great. Actually, they are kind of essential for a nice touring experience. However, don’t forget to look cool too with the Scorpion EXO T1200 Quatro Helmet.